It was my first time traveling to the Philippines! Needless to say, I was excited. I had targeted Manila City and its surroundings for my 6D/5N visit. 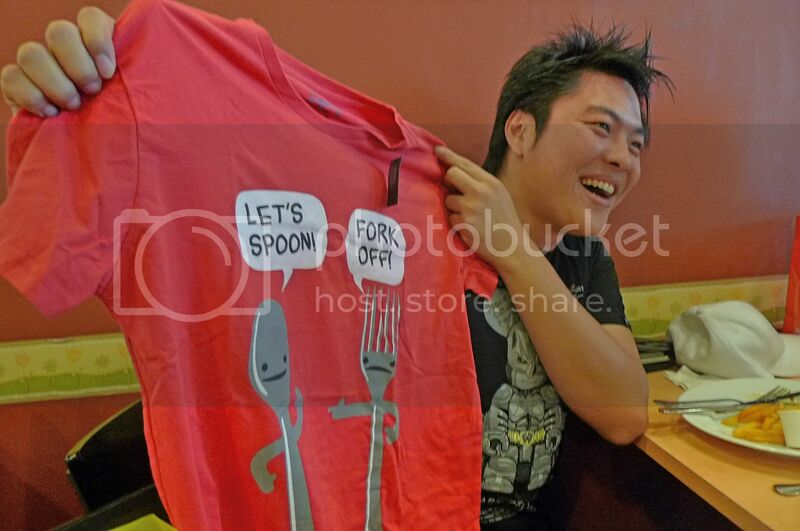 I was looking forward to see many things in Manila and to meet up with two Filipino bloggers there! So on one fine early morning in January 2011, I found myself at the LCCT airport checking in my luggage. It was a breeze doing so as there wasn't a big crowd. 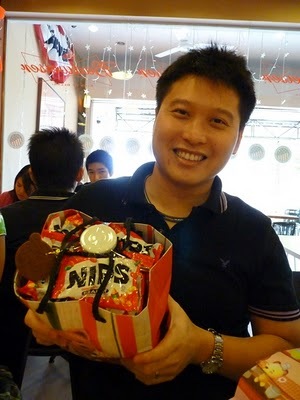 Probably doing my own self check-in on the AirAsia website at home the night before helped me escape the normal crowd. The AirAsia plane departed at about 7.20am and reached Manila at 11am. I did not have proper sleep the night before so I tried to sleep in the plane, but found it impossible to do so. I don't know if it's just me, but I always have difficulty falling asleep the night before I travel to a foreign country! And AirAsia seats were just not conducive for sleeping! Upon landing at Clark International Airport, I was asked by the custom officer how much Philippine pesos I brought with me. Well, I actually brought 11,000 pesos but it was against the law to bring more than 10,000 so I said 10,000. LOL! I forgot to take picture of the Clark Airport (also known as Diosdado Macapagal International Airport) so here's a picture taken from this site HERE. It was a small airport serving only budget airlines like AirAsia and I knew before I went to Manila that I had chosen the wrong airline and the wrong airport! Why wrong airline and wrong airport? Well, because AirAsia only lands at this airport and not Manila International Airport (also known as Ninoy Aquino International Airport) which charges higher landing fee and which is just within 25 minutes to Manila. 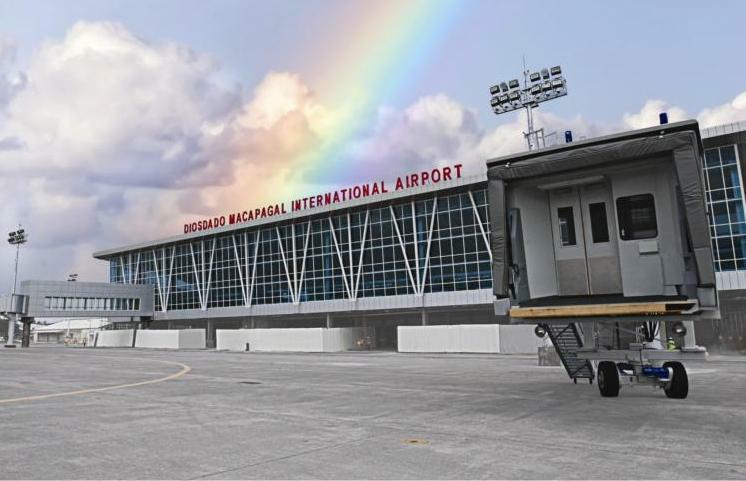 The Clark Airport on the other hand was located far away from Manila in Angeles City, Pampanga. 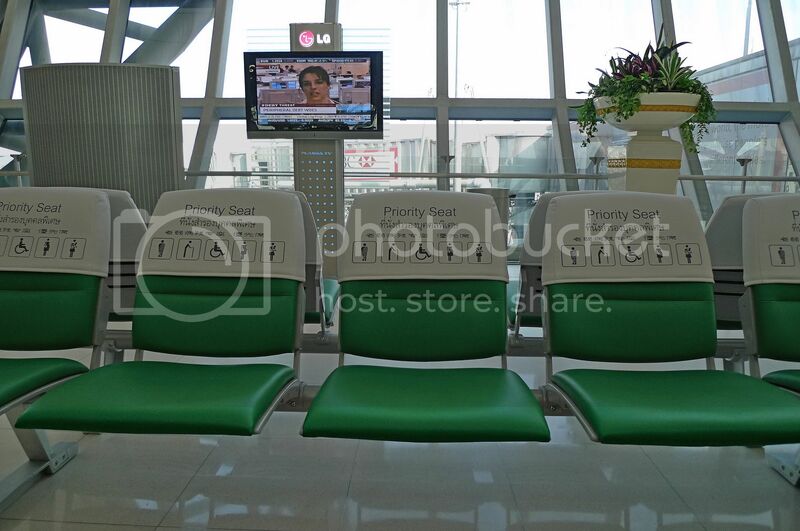 To get to Manila, I had to take a bus from the Clark Airport to Pasay Bus Station in Manila. I bought the bus ticket which was priced at 350 pesos (RM25) at the counter near the airport exit. The air-conditioned bus, operated by Partas was however quite comfortable. I did not manage to sleep in the bus though I wanted to. It took me about 1 hour and 45 minutes to reach Manila. So for those of you who want to go Manila, do not fly AirAsia unless you don't mind the long journey from Clark Airport to Manila City! 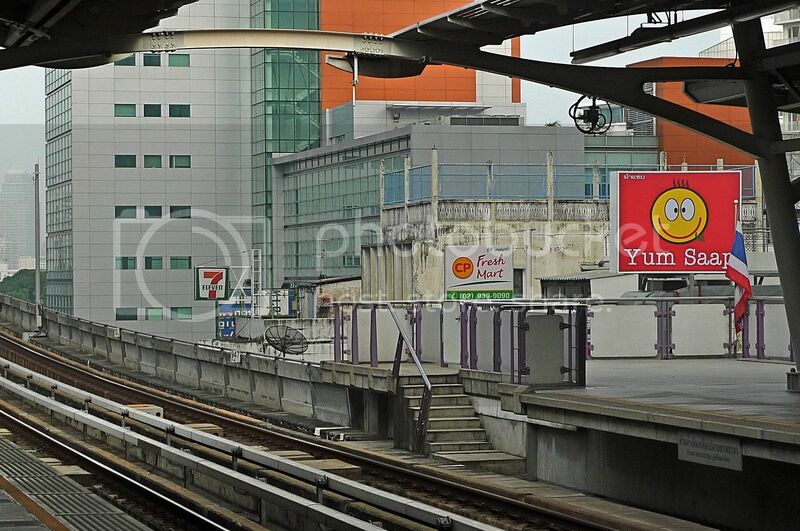 When I reached Pasay Bus Station in Manila, it was already almost 2pm. A few people approached me asking me which hotel I would be going to, but I did not trust them. One said he would charge 300 pesos (RM22) to take me to my hotel. I slashed it to 150 pesos (RM11) and he shook his head. Oh well, I was not going to be cheated! 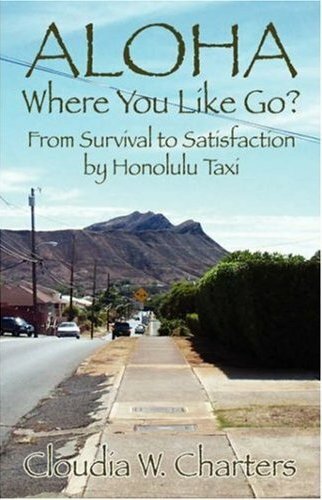 I walked out of the bus station and down the road with my luggage in tow, trying to flag down a taxi. But it was quite impossible to get a taxi at that time, so when I finally got one, and the driver agreed on the 150 pesos (which I knew was still too expensive but what the heck!) I quickly jumped into the taxi feeling totally relieved! 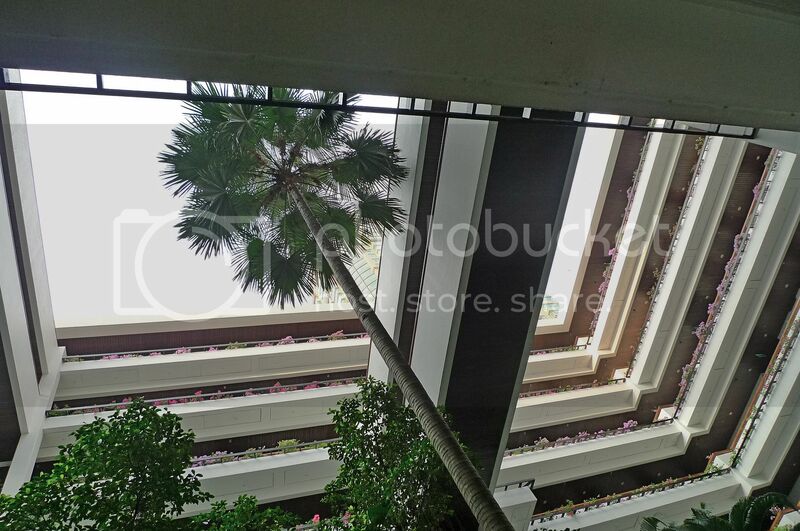 It took about 20 minutes to reach Lotus Garden Hotel where I would be staying. Located at the corner junction of A. Mabini and Padre Faura streets in Ermita, the Lotus Garden Hotel is a budget hotel and quite a comfortable one at that! 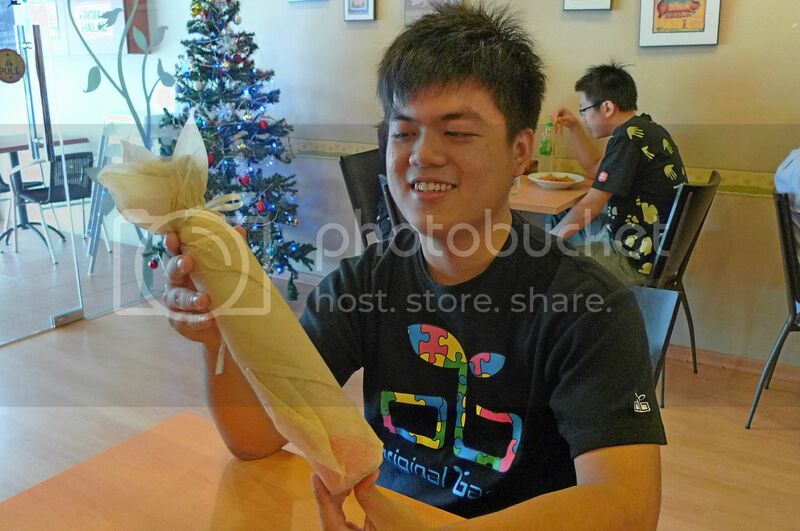 This is my last post on my 2010 Bangkok Trip. 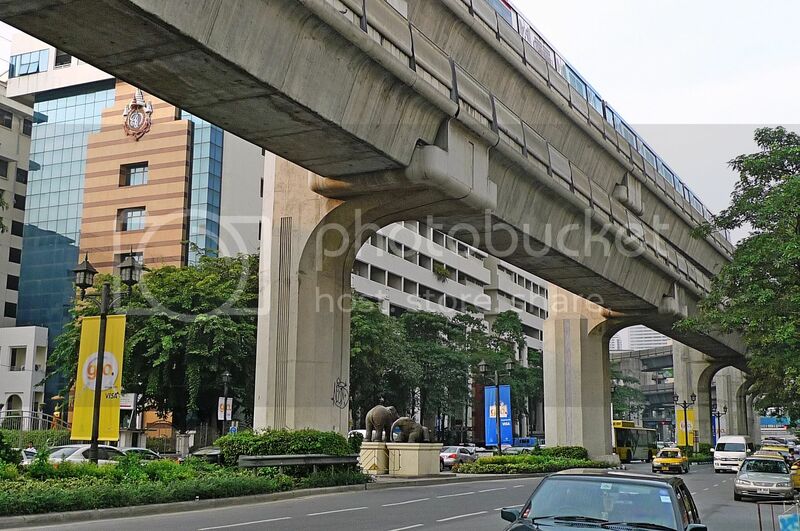 This trip was not very adventurous as I did not visit a lot of Bangkok's famous tourist places. But that's OK as I had visited most of the tourist attractions last time. It was however, a very happening trip as I got to shake hands with Enrique Iglesias, attended a live concert by K-pop artists like Super Junior and CN Blue and stayed in one of the most expensive hotels in Bangkok, which is Dusit Thani Hotel. And so on my last day in Bangkok, it was with heavy hearts that my friend and I checked out of Dusit Thani and headed to the airport. The first thing we did when we reached Suvarnabhumi Airport was to have our lunch. 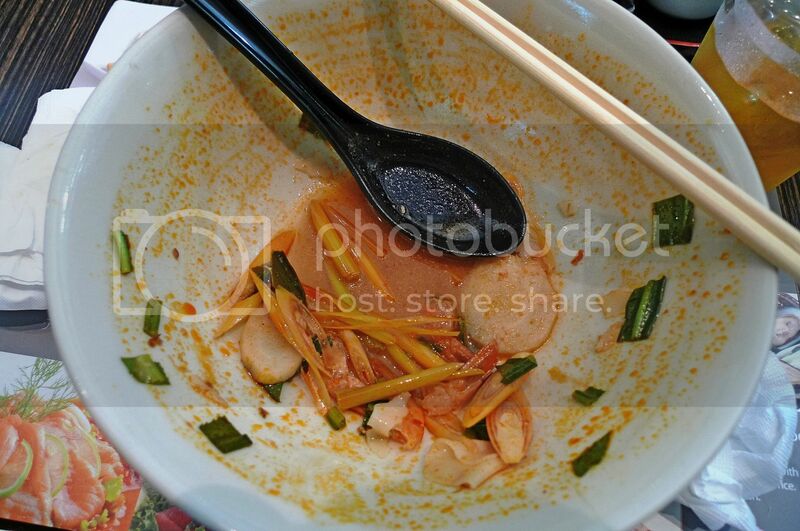 I forgot the name of the restaurant but I ate tom yam goong. Well, I had to. 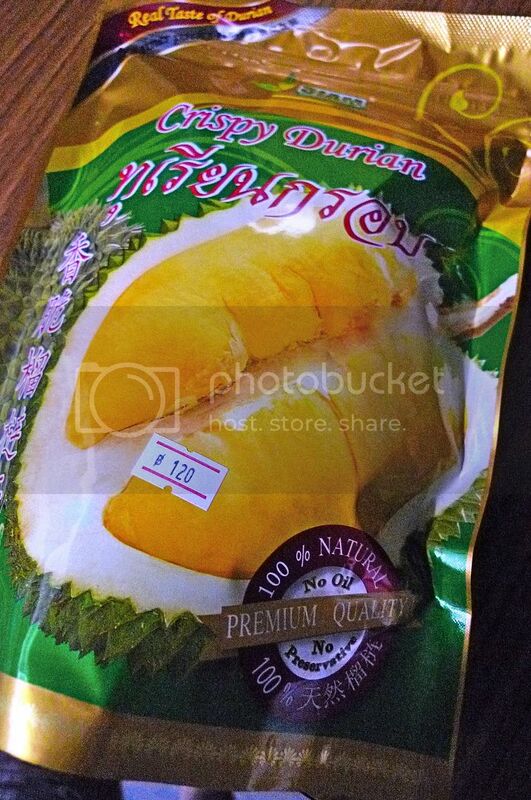 I knew that once I leave Bangkok, I would never get to eat this favourite dish of mine. My friend ate fried rice. 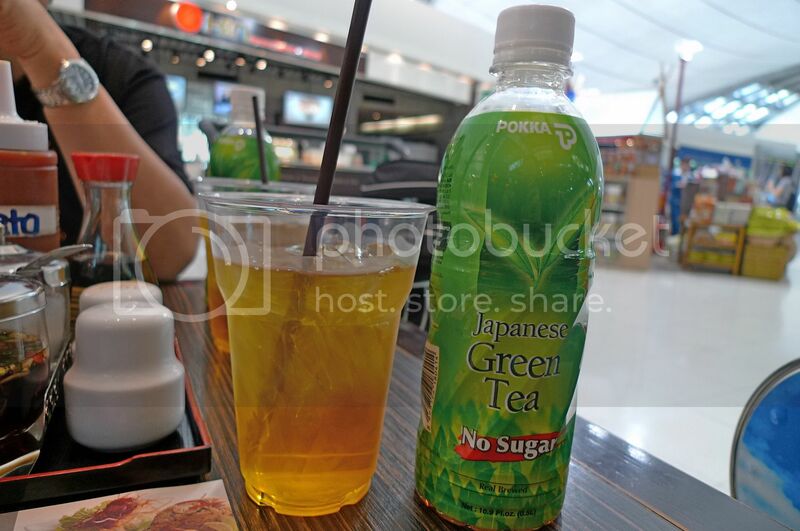 And we both had Pokka Japanese Green Tea for drinks. 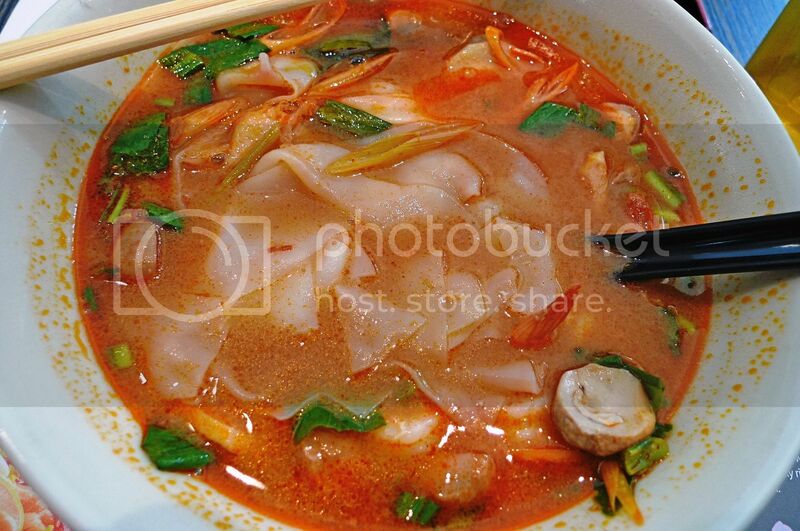 I enjoyed my tom yam goong. Look! I almost finished the soup! Yummy!! After checking in our luggage, we walked towards the Departure Area and passed by this structure with Buddha figurines. There were two people cleaning it. 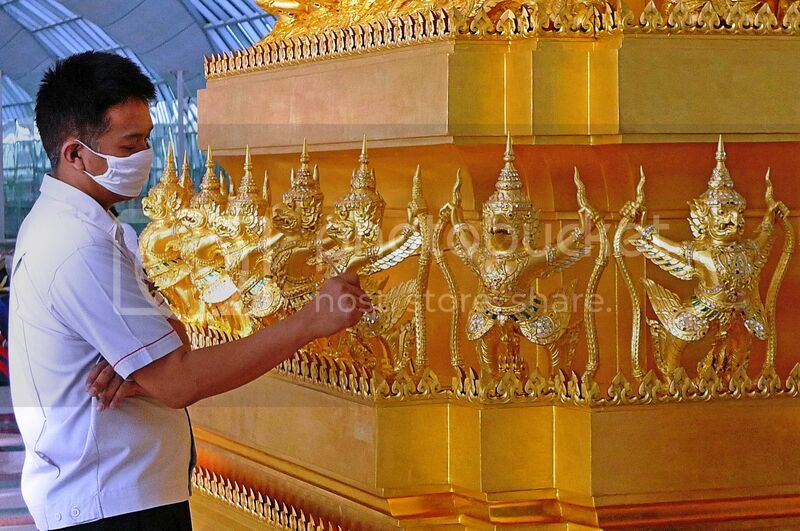 Actually, I was not sure if they were cleaning, dusting or painting it! 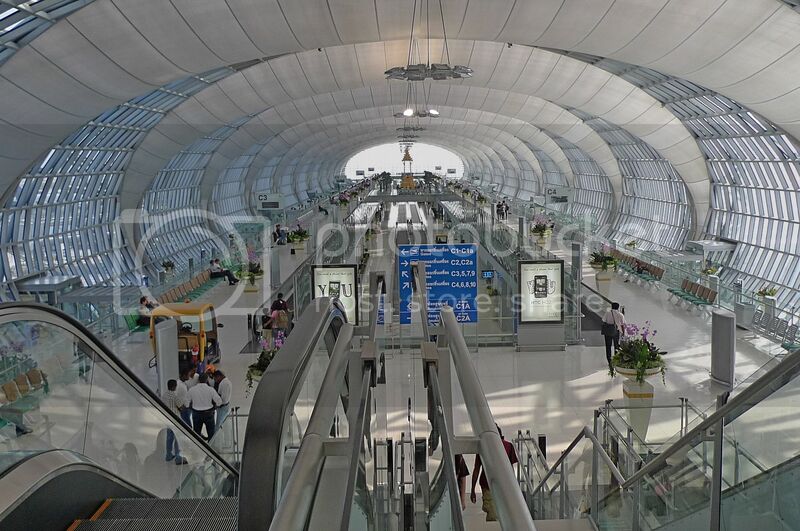 I like Suvarnabhumi Airport. It was very grand, modern and nice. I watched the TV while waiting for our plane to arrive. what is that? Mummified people? Mummies? Mumm-ra? Hahaha!! I wished they had included a picture of a panda in there too! 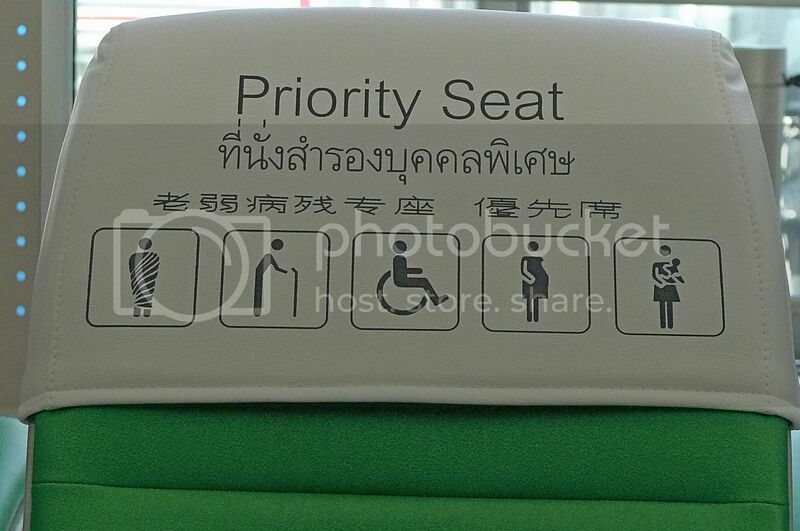 Then I will surely be assured of a seat! LOL! Soon, our plane arrived and we left for home. Goodbye Bangkok! I hope to see you again soon! Well, here's my latest update - I just bought AirAsia ticket for my next trip to Bangkok for RM150 return flight. Is that cheap or what? 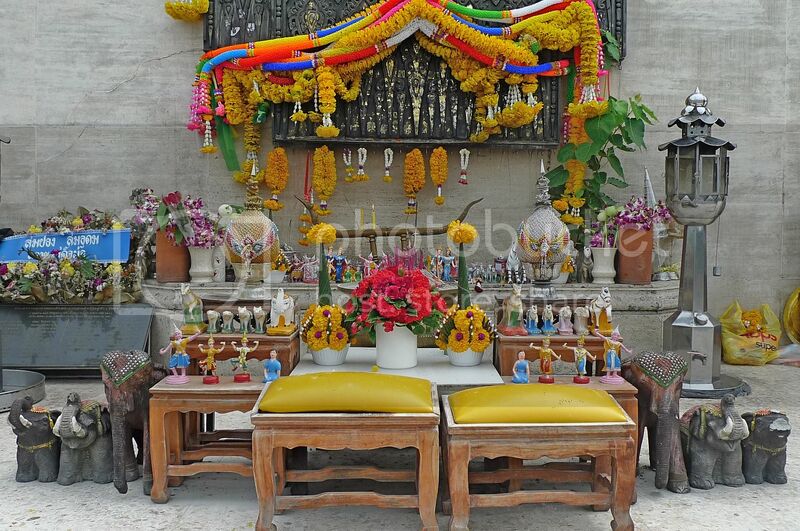 For those of you who have missed some of my Bangkok posts, here is the complete list. 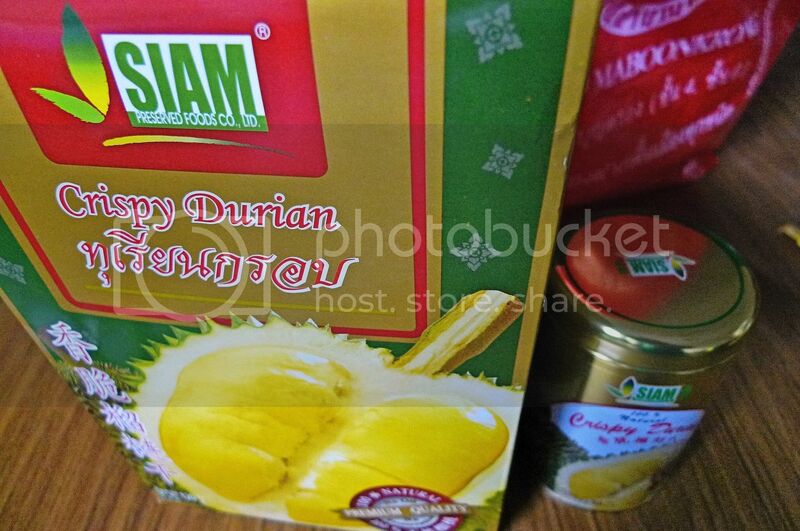 8.The Best Sticky Rice With Durian! 9.I Discovered The Juciest And Most Affordable Steak At Jeffer! Coming Up Next : My Very First Trip To Manila! I enjoyed walking around in Bangkok. 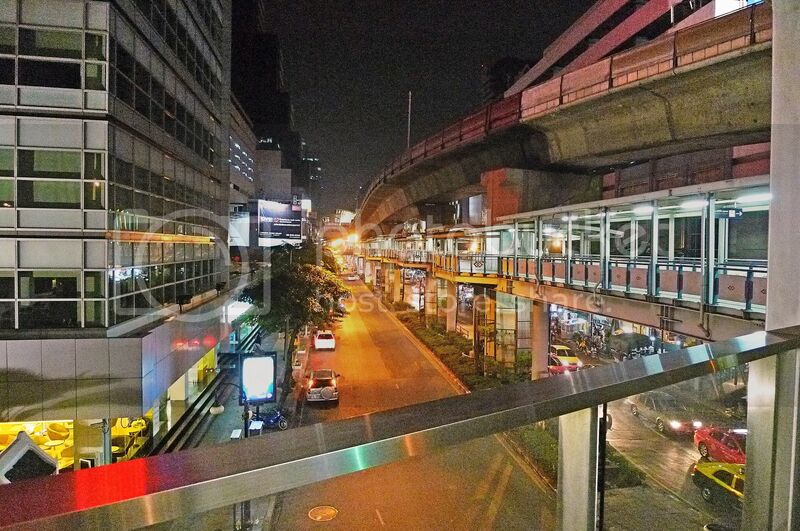 During my Bangkok trip late last year, my friend and I spent most of our time walking around and shopping. 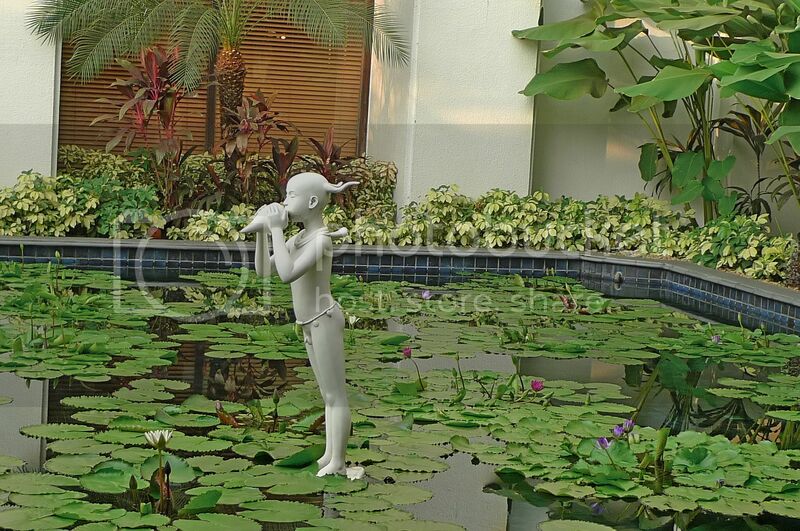 There was this statue located opposite Dusit Thani Hotel where we stayed. 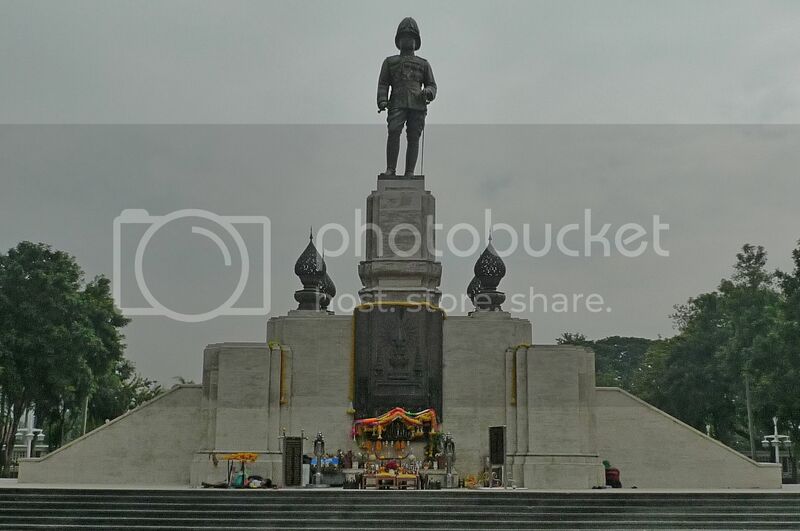 It was actually the statue of King Rama VI, who reigned as King of Siam from 1910 to 1925. The statue stood at the southwestern entrance to Bangkok's famous Lumpini Park at the junction of Rajdamri Road and Rama IV Road. It was a pity we did not have the time to visit the park as it has a man-made lake where visitors can rent boats. It is also a good place to jog and cycle and it contains a public library, an indoor stadium and even a dance hall! Well, I will make sure I visit Lumpini Park the next time I go Bangkok! Oh! I even found a map of Lumpini Park HERE. By the way, I saw these below the King Rama VI statue. Although walking is good, I actually enjoy traveling around in tuk tuks! Here I took a photo while traveling in one! 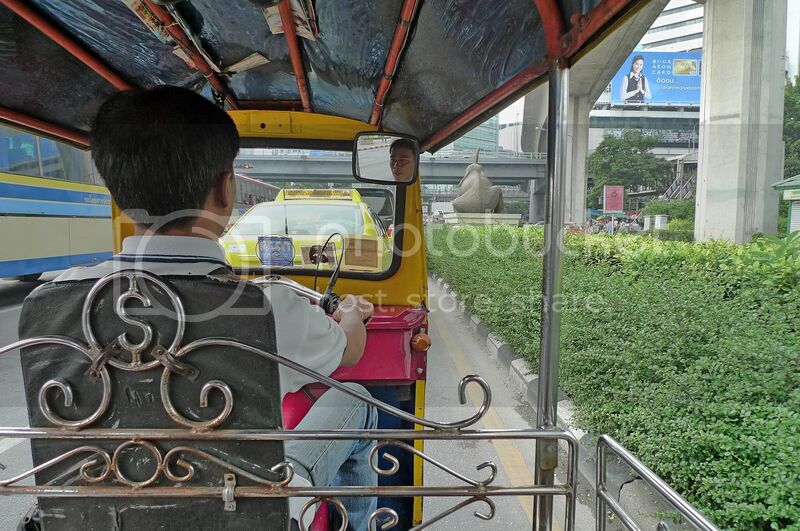 Tuk tuk is one of the fastest ways to travel in congested Bangkok roads. The drivers simply know how to weave in and out of the traffic at breakneck speed! Sit in a tuk tuk if you want to get somewhere fast! There are lots of temples to visit in Bangkok, but this time I chose just one, if you don't count The Erawan Shrine. But I forgot the name of this temple! 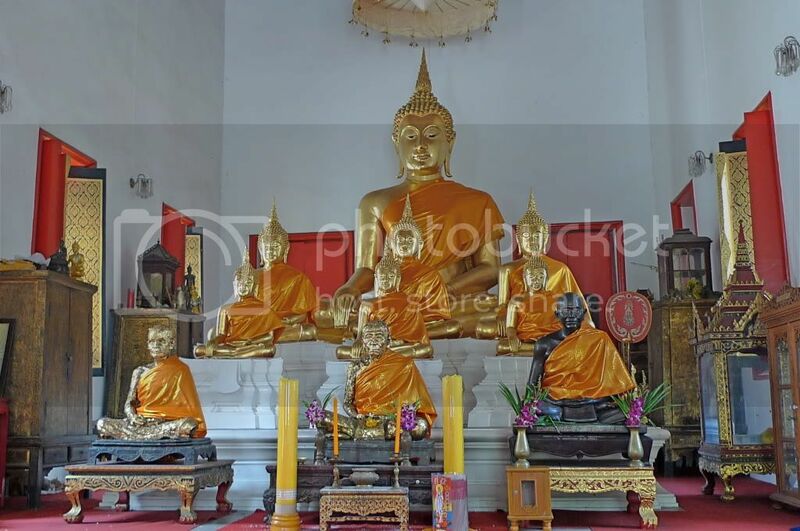 I was told that it was not good to take pictures of humans with these holy statues together inside a temple. However, taking pictures of people with Buddha statues outside the temple is OK. 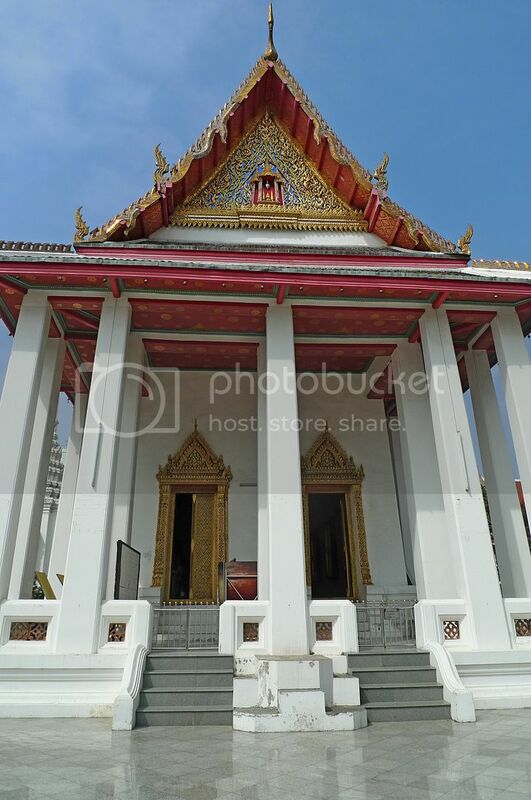 This is the front view of the temple. It is not a very grand looking temple, I must say. 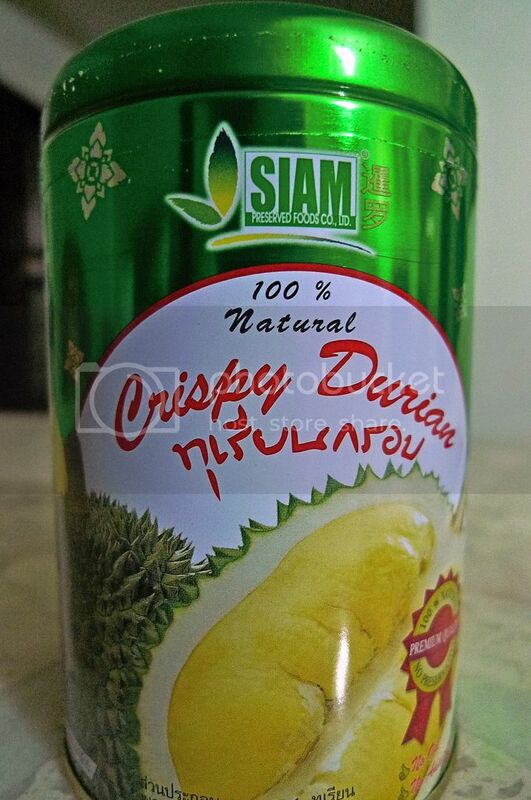 Although I stayed at Dusit Thani Hotel, that did not stop me from visiting other hotels along the Rajdamri Road. 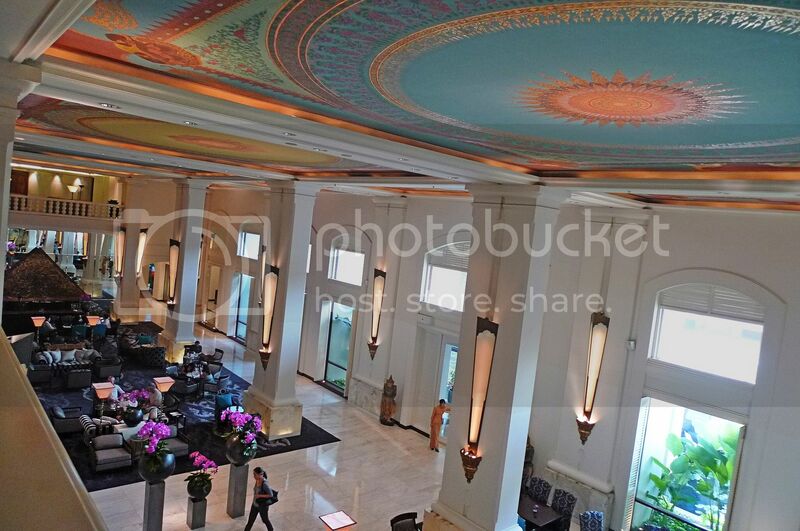 This is the Grand Hyatt Erawan. 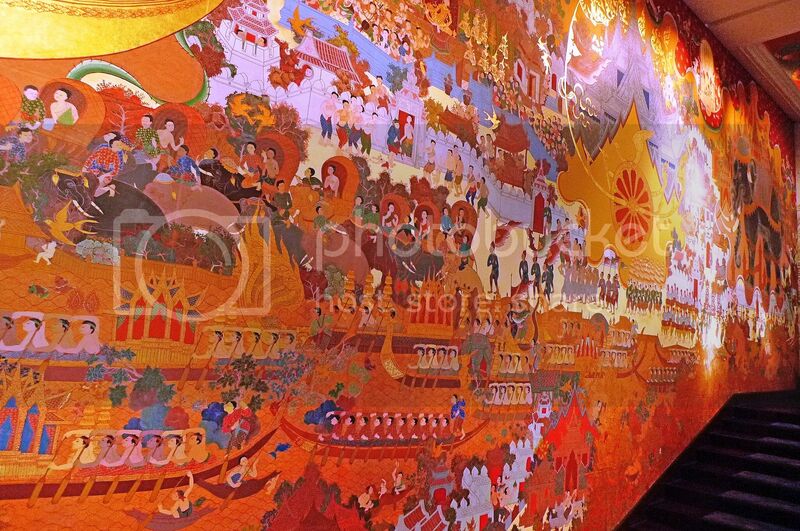 Yes, it's the one just next to the famous Four Faced Buddha or the Erawan Shrine which I blogged about previously. 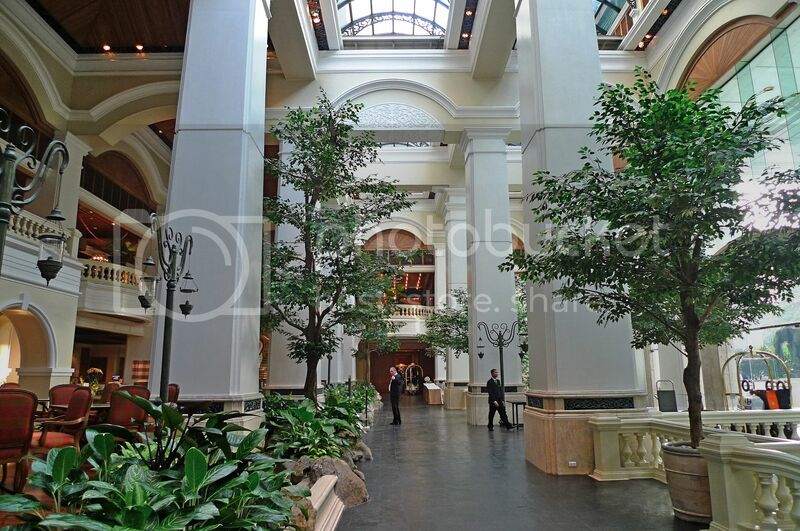 The lobby looks rather grand, doesn't it? 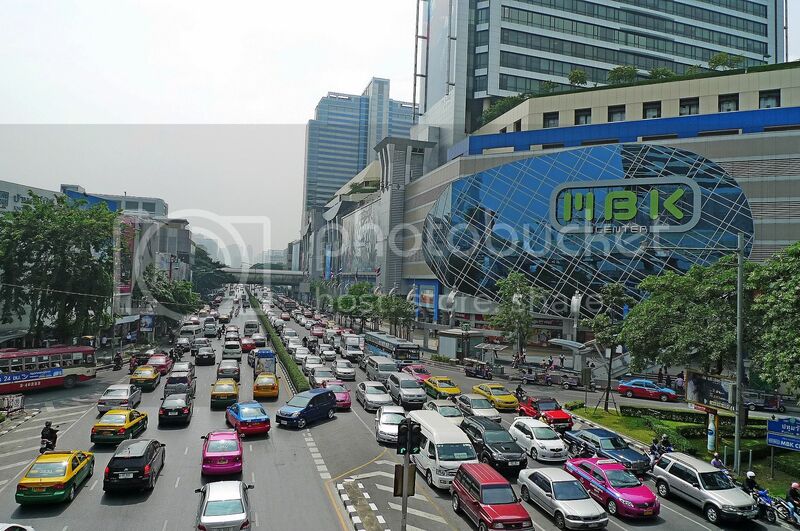 I took this photo of the Rajdamri road when I exited from the Grand Hyatt Erawan. Notice the Skytrain line that runs parellel with the road. 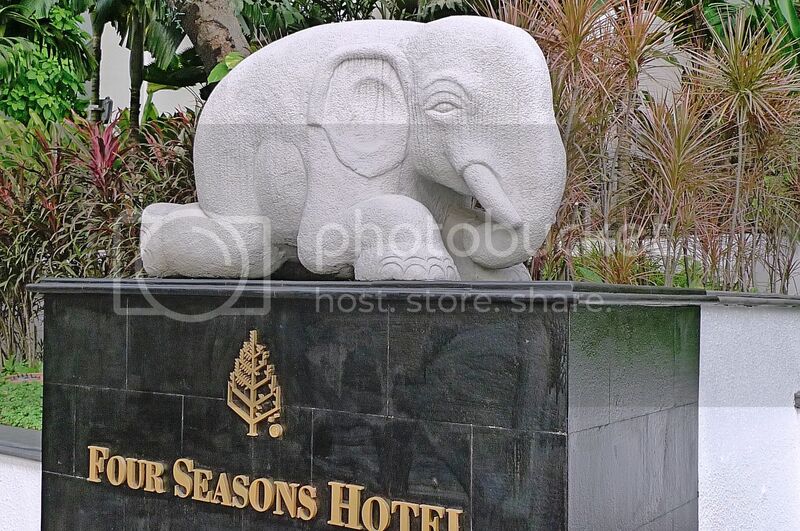 The next hotel my friend and I stopped by was the Four Seasons Hotel. The hotel had a nice pond outside the main entrance. 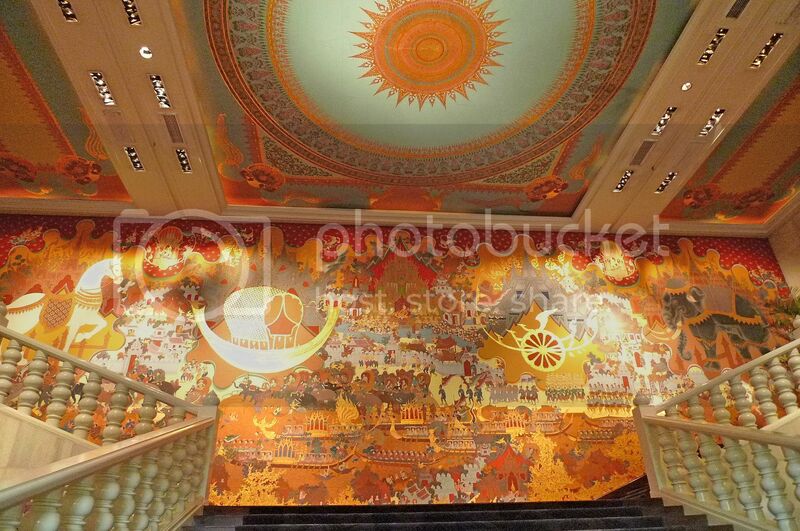 Inside, I was awed by the pictures on the wall! I think it was beautiful but it would be quite dangerous if you lose yourself looking at the picture while climbing up the stairs! From the first floor, looking down at the lobby below. 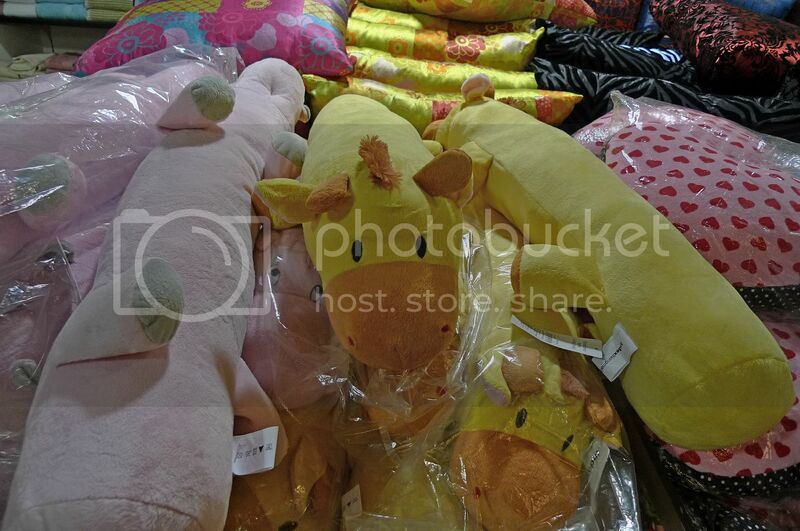 Thai people seems to like elephants a lot! 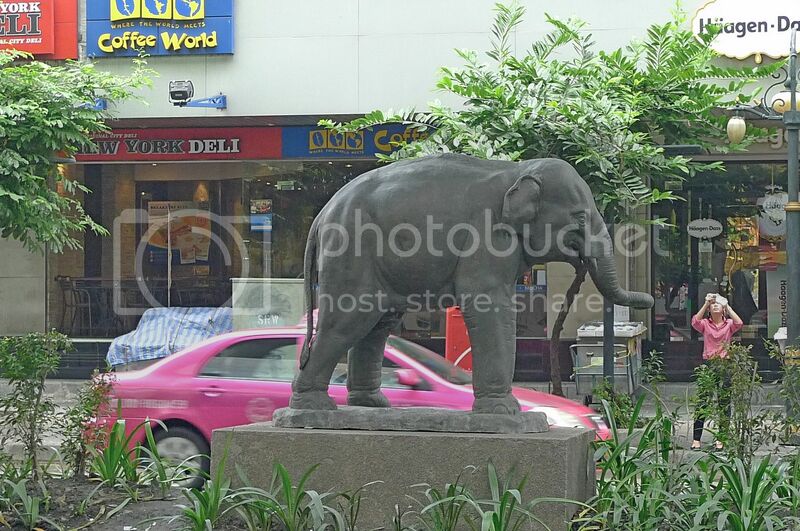 I saw an elephant while walking along Silom Road. Of course, it was not a real elephant. But then again, I heard that they were so crazy about the pandas at Chiang Mai Zoo that an elephant was painted black and white just like a panda to get some attention! See the picture of that "panda" elephant HERE! Ooh! 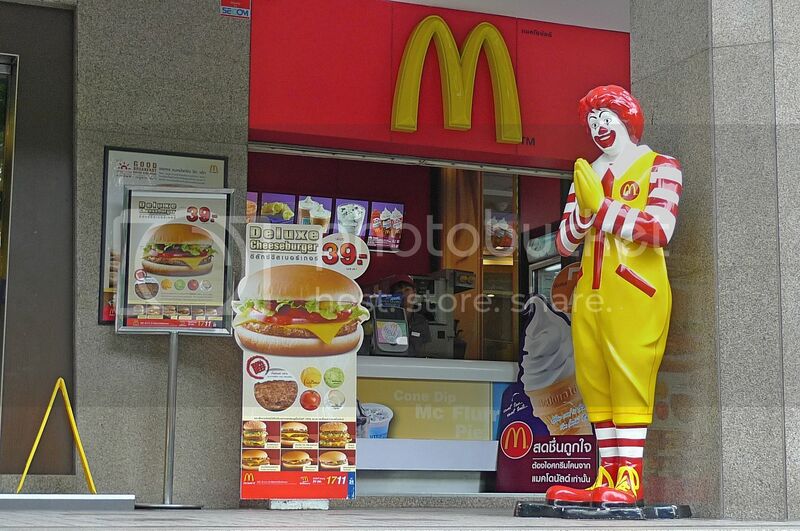 I love it that Ronald McDonald is doing the wai (ไหว้) here! Did you know that there is a Madame Tussauds wax museum in Bangkok? 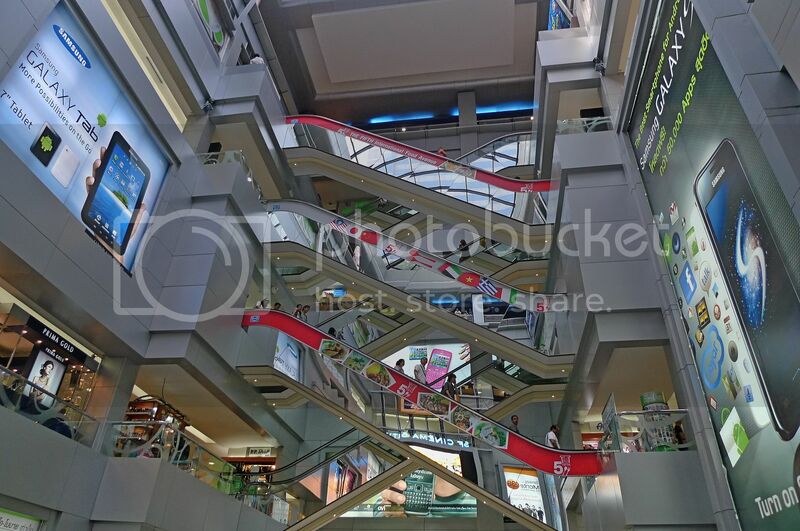 Yes, there is and it is located on the 6th floor of Siam Discovery. It was in fact, the 10th Madame Tussauds to open worldwide on December 4th 2010. Unfortunately, my friend and I were in Bangkok in November and the wax museum was not ready yet! So we were just contented to read about the launch from a counter selling the tickets. Looks like there will be wax figures of Michael Jackson and Brad Pitt from the brochures. If you plan to go Bangkok, don't miss Madame Tussauds Bangkok! More info HERE. 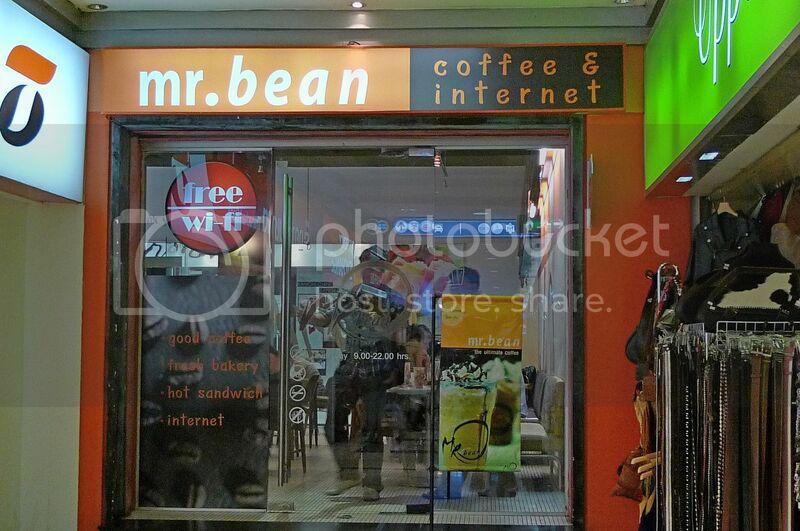 I came across Mr. Bean Coffee & Internet shop at MBK Mall and took a photo of it. It was a shop selling coffee, sandwiches and cakes but I did not eat there. Well, don't worry. I will visit Mr Bean the next time I go Bangkok! 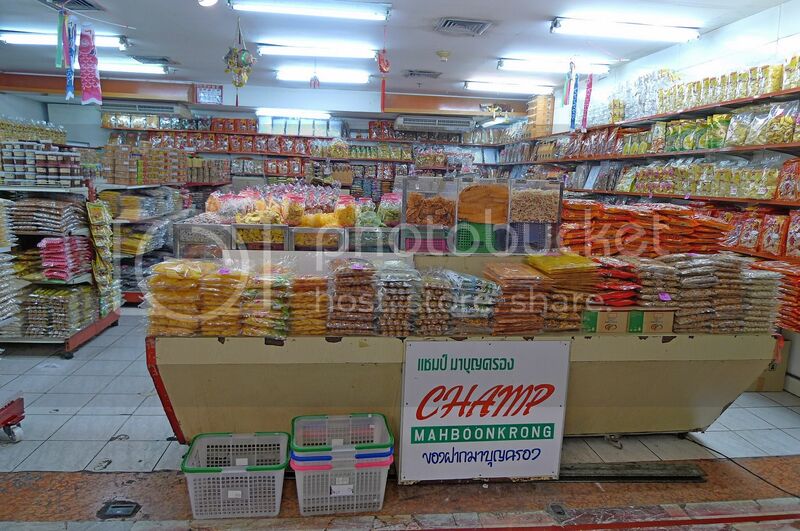 Another shop or restaurant I must visit next time I go Bangkok is Yum Saap! I saw the advertisement while boarding the SkyTrain. 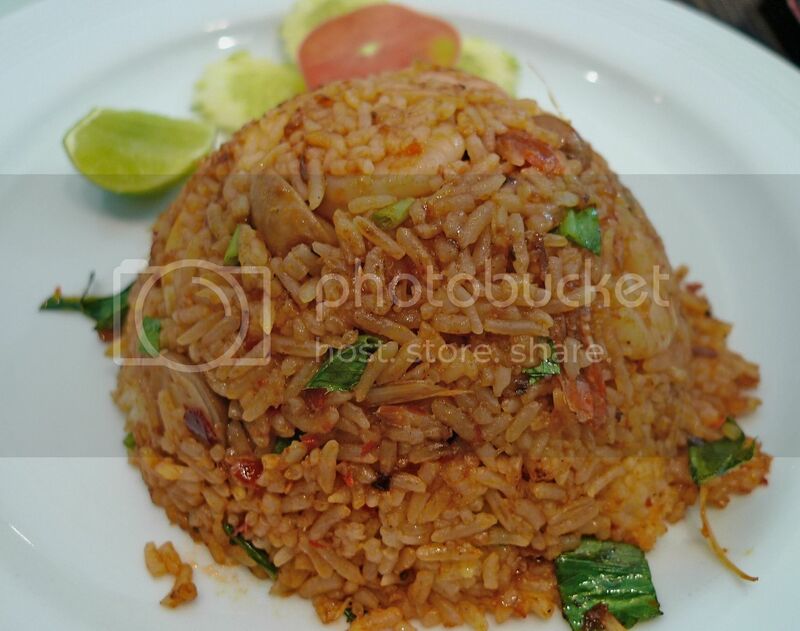 This restaurant franchise is famous for serving traditional Thai food at cheap prices! 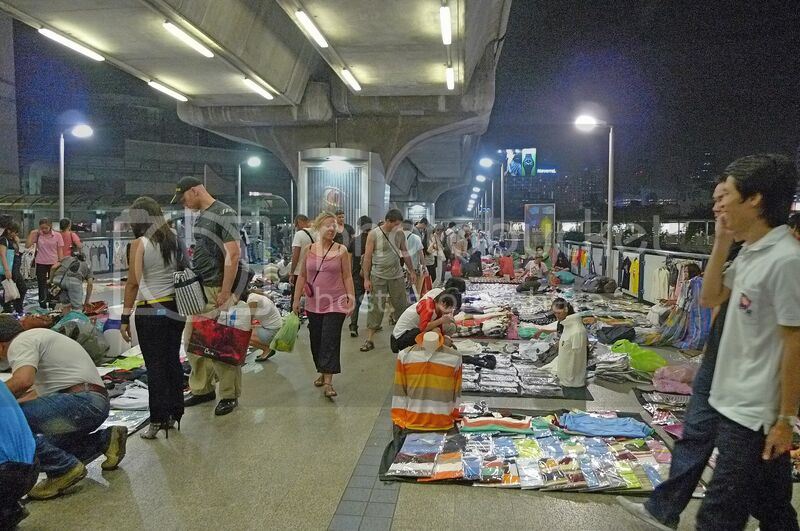 One night after shopping at MBK Mall, my friend and I were walking to the SkyTrain station when we saw a busy night market right next to the station! We did not buy anything though. After shopping the whole day, we just wanted to go back to our hotel to rest. It was fun walking around in Bangkok. I am falling in love with Bangkok all over again! OK I know this post is long overdue, but I just got to do it now before the next Christmas arrives! Haha! 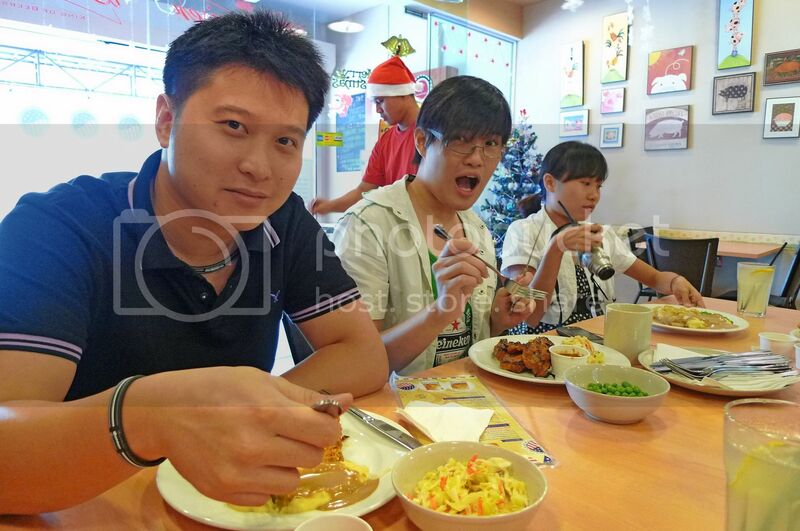 Can you believe today is the last day of Chinese New Year and here I am, blogging about a Christmas gathering I had with my group of blogger and twitter friends last December! Witch came out with this idea of a Secret Santa gift exchange program, where via an online website called secretsanta.com, each of us were given the name of the person to whom we have to buy an Xmas gift for. It's called Secret Santa because none of us know who is our respective giver or Santa. So the fun came into play when each of us had to guess the identity of our Secret Santa! 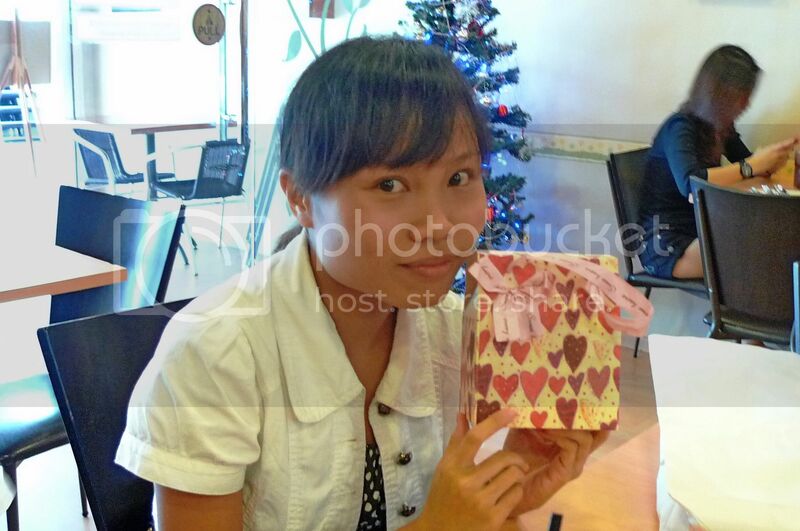 We gathered at Betty's Midwest Kitchen in Aman Suria around noon for this gift exchange event. 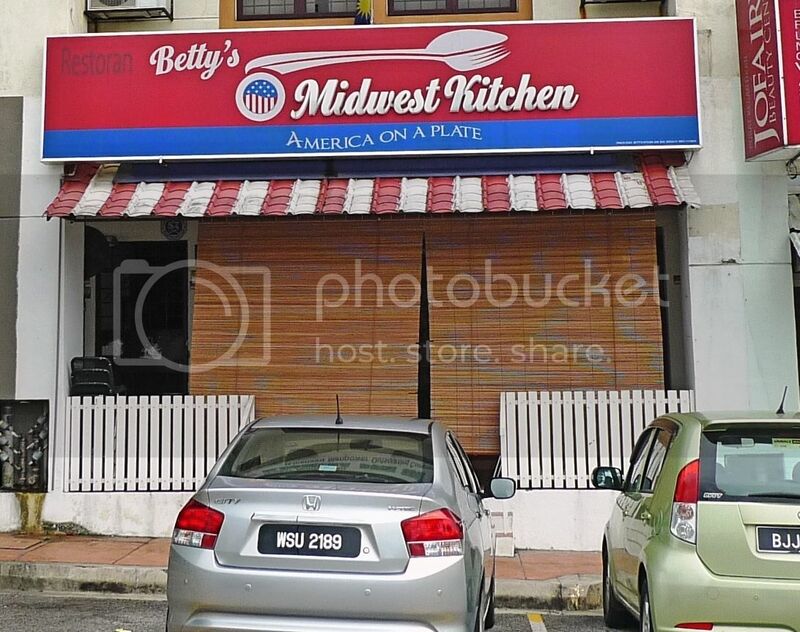 It was my first time to this American Midwest cuisine restaurant. 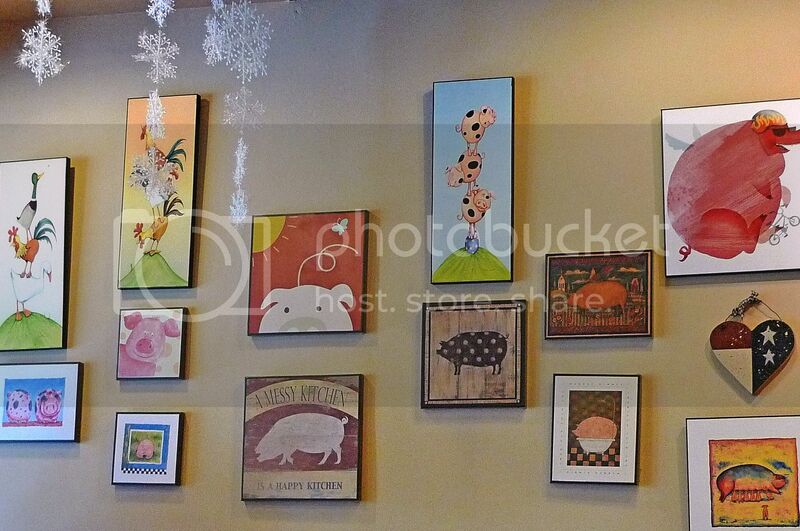 Upon entering, I saw lots of piggies pictures on the wall! 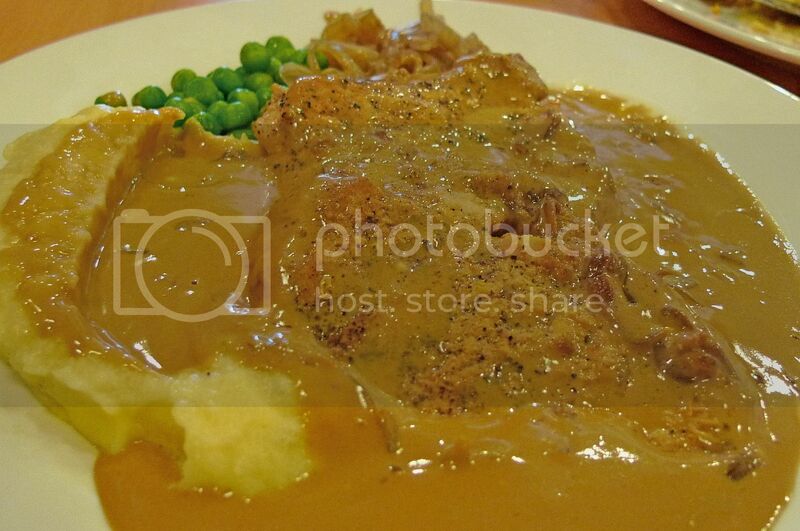 Maybe that was why I decided to order this Classic Meatloaf! 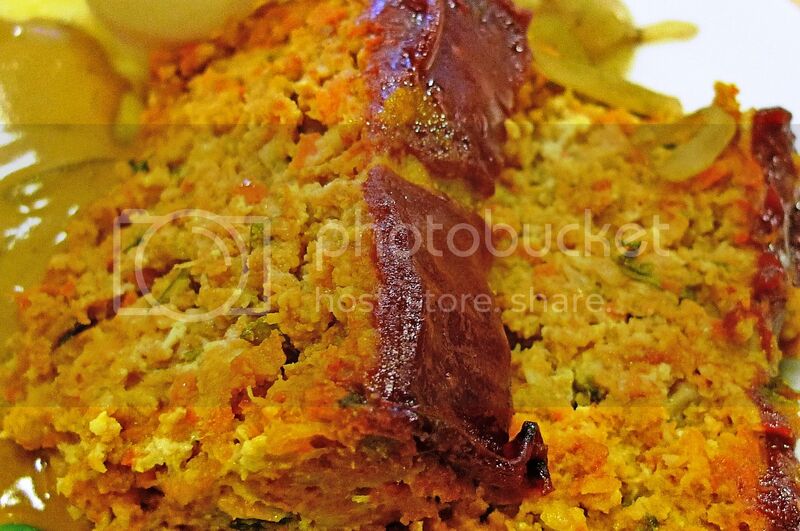 Those meatloaf look like cakes, don't they? Haha! 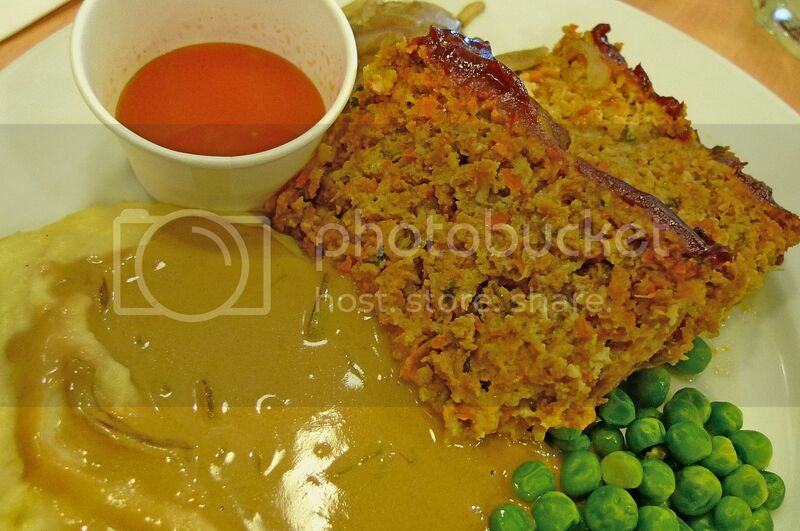 They were actually pork meatloaf served with mash potato, peas, onion relish and Betty's in house beer-based dip. Saucer ordered the same dish as mine. It was not bad, but I did not really like the beer-based sauce! 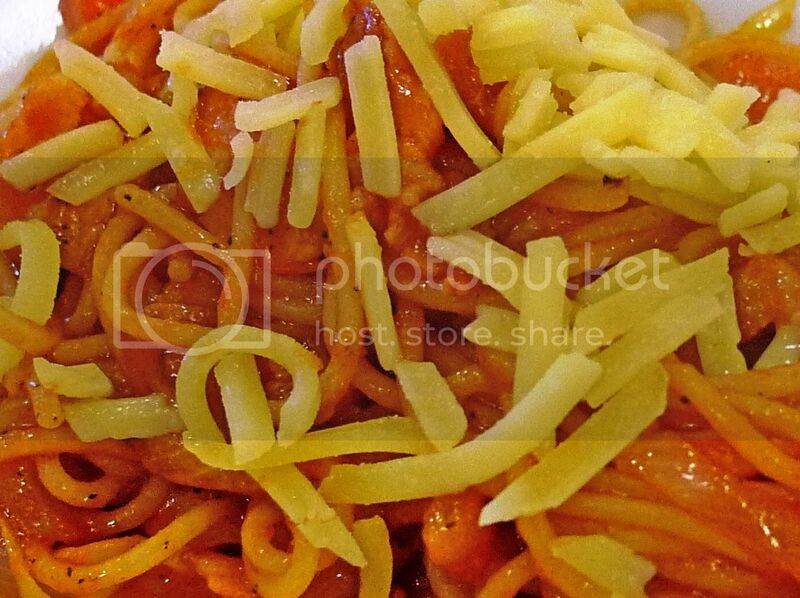 Merryn and Ethan had the Bacon Tomato Spaghetti which I sampled a little. I think Witch's home cooked spaghetti is better, though I have yet to try her cooking! 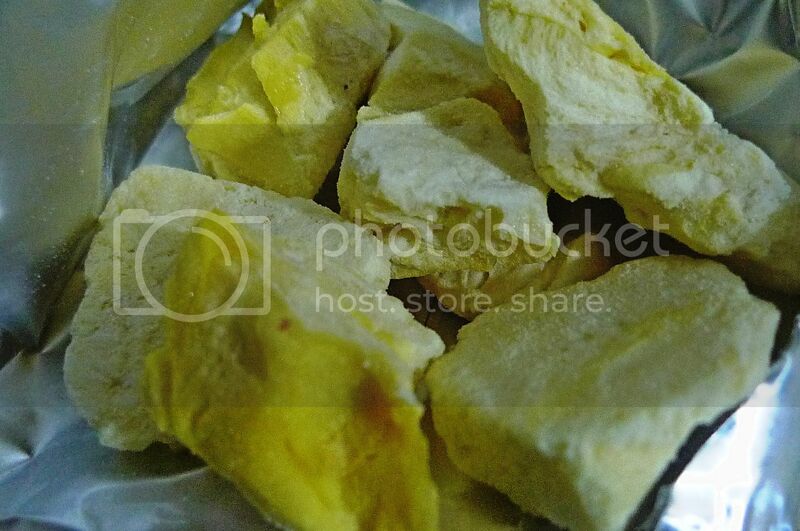 Merryn's hubby, William had the Beer Batter Fish. 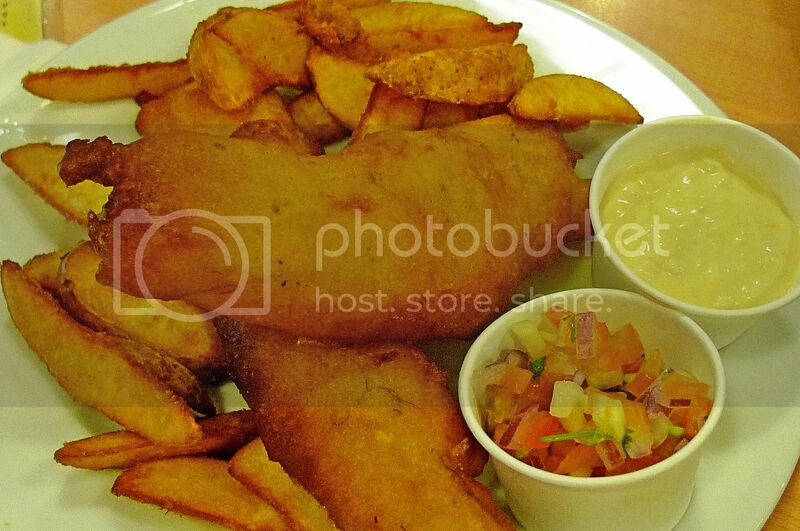 It was fried fillet of dory in beer batter served with potato wedges, homemade tomato salsa and Betty's in house tartar sauce. Witch herself had Pork Chops with Country gravy. Witch, being the expert food blogger, complained that the pork chop was tough, dry, and overcooked. Luckily I did not order this dish! Eric ordered the Pulled-pork Burger. 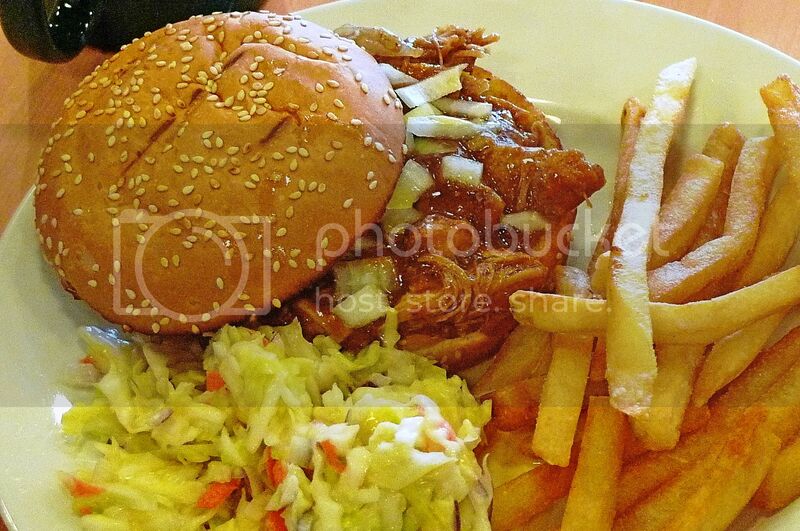 The burger contained shredded or "pulled" pork which had been slow roasted and braised in a special sauce served with coleslaw and fries. Was it nice? Gotta ask Eric! 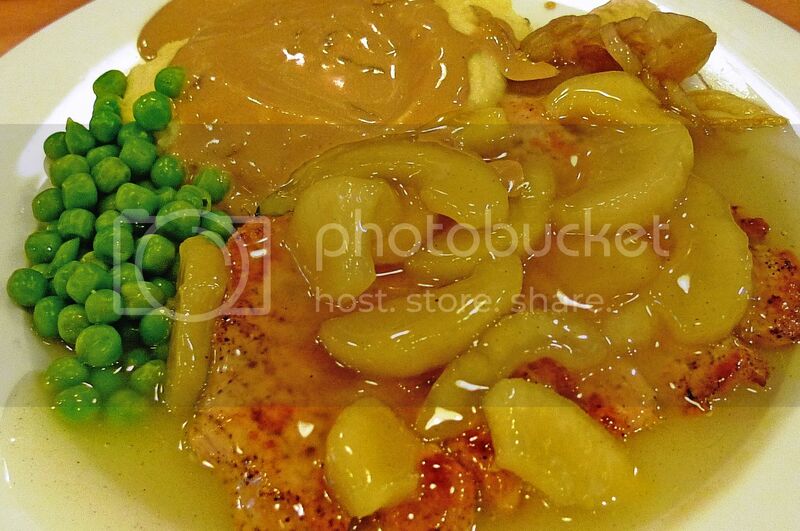 Erika had the Pork Chop with Apples, which looked very appetizing to me! The best dish was probably the Pork Belly ordered by both Grey and QuaChee. Well, they both praised the dish. Even Witch tried some and said the meat was tender, moist and flavourful! 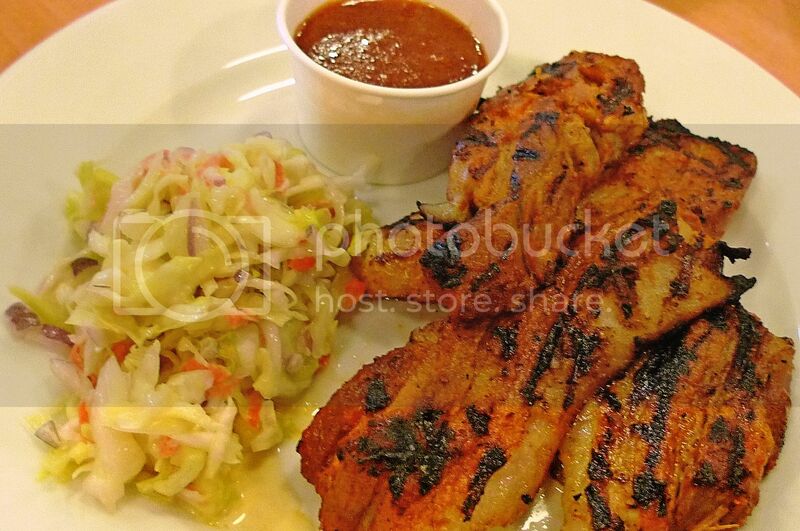 So yes, I will definitely order this Pork Belly on my next visit! Lastly, we all had Dog Food. No I am not kidding, we really had Dog Food! Here it is! 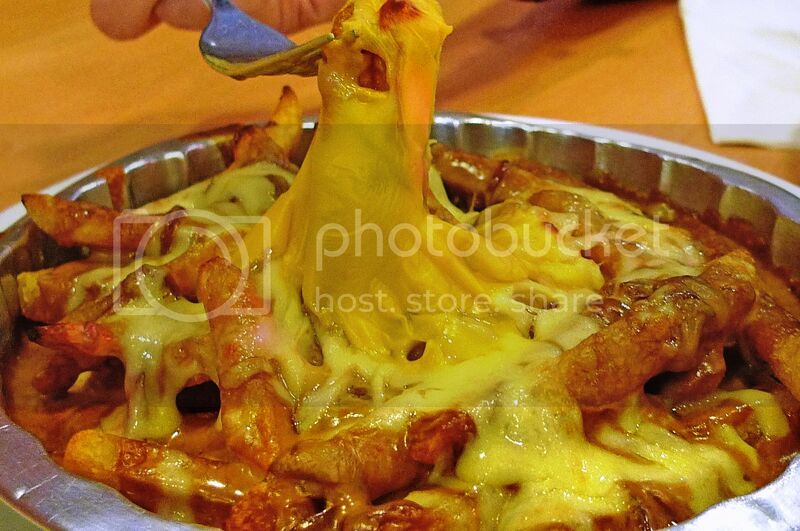 It was actually oven cooked fries drenched in gravy and topped with lots of cheese! Your dog will probably love it! Haha!! 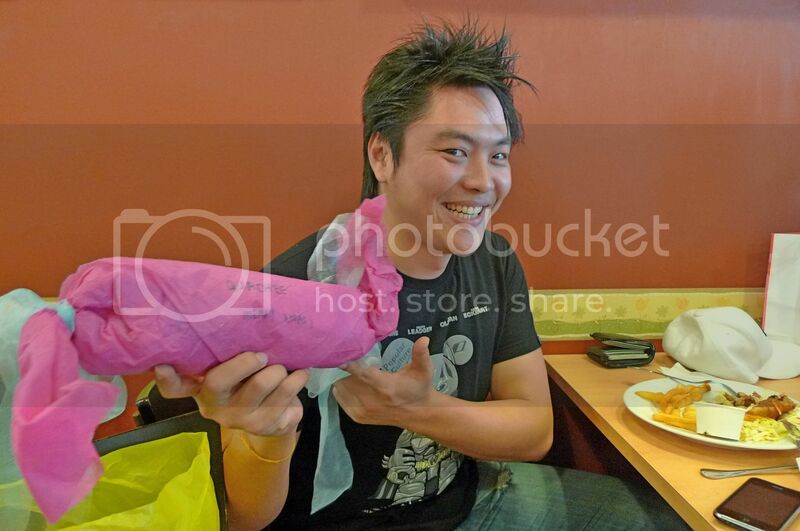 After filling our tummies with these wonderful food, we commenced with our Secret Santa gift exchange. All our presents were placed under a Christmas tree. Adrian, who did not eat anything for lunch except the dog food (don't ask me why!) was the first to take his present. 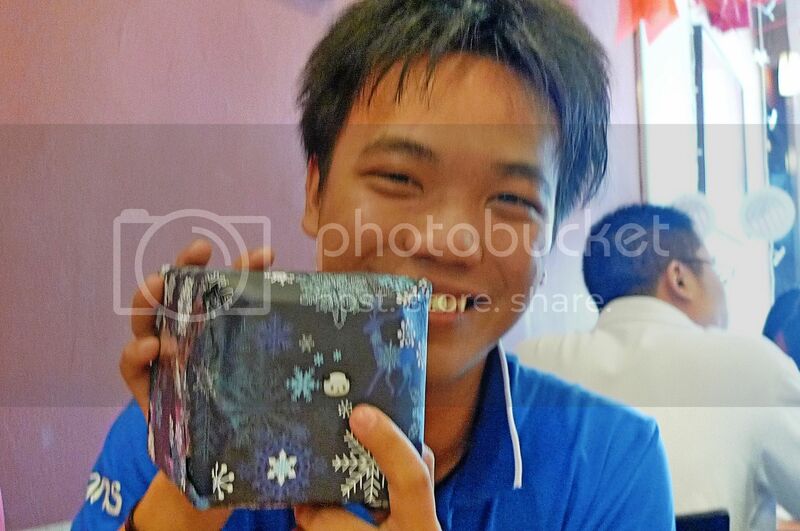 Guess who's his Secret Santa? His Secret Santa is Panda ie me! Haha!! 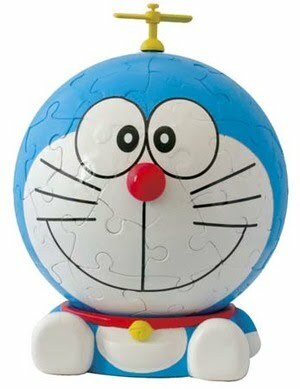 I got him a 3D Doraemon Jigsaw Puzzle and since he is a magician, a pack of cards as well. I wonder if Adrian had put the pieces of jigsaw puzzles together. If he had, he did not show me! But the end result would look like this. Adrian was having difficulty trying to guess who was his Secret Santa when spoilsport QuaChee asked him what was that tiny panda doing at the bottom of his present! Dammit! A dead giveaway I know! But I was hoping that in the event that Adrian could not guess correctly, I would ask him to look for hints on his present! Oh well....! Grey received a Bali Spa CD from Erika. But he managed to guess his Secret Santa because Erika signed her name on the card! Erika herself received a feather hair band (if not mistaken) from Caroline who could not make it for this gathering. 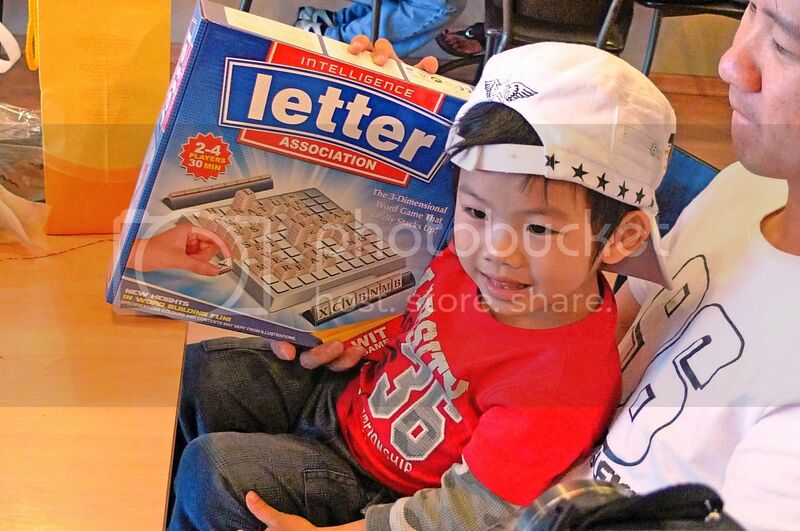 Cute Ethan got a letter puzzle from Grey. It was supposed to be a gift for Merryn but she had requested earlier that she wanted a present for Ethan instead. In turn, Saucer received NIPS chocolates from Merryn. I forgot to take photo of Saucer with his gift so I shall borrow from Merryn's blog. Not sure why NIPS chocolates but that's not going to help with Saucer's weight, that's for sure! 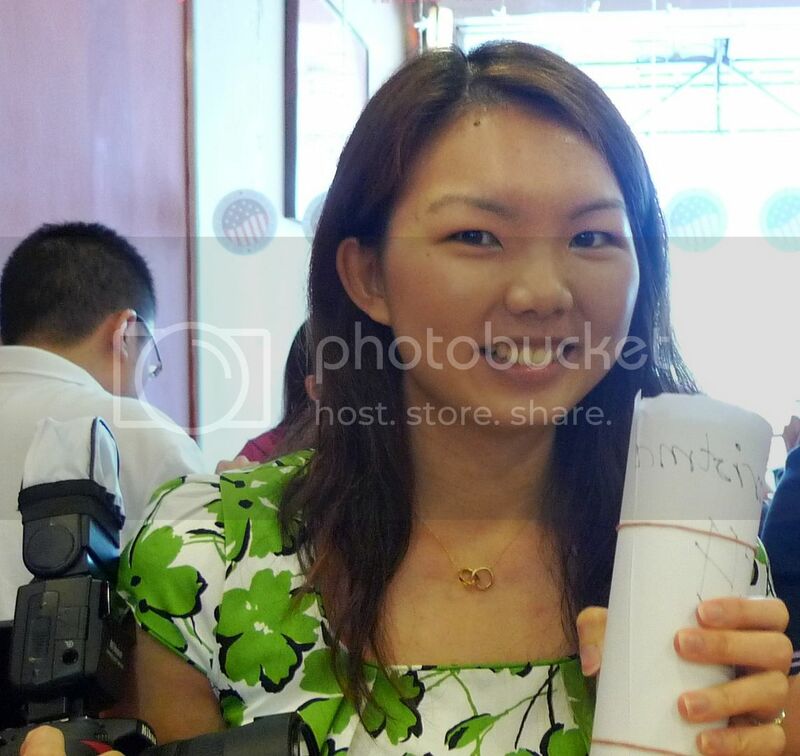 Saucer's wifey, Witch received a gift from the magician Adrian and it was a Starbucks tumbler! Nice! She managed to guess who her Secret Santa was! She must have used her witchy spell! 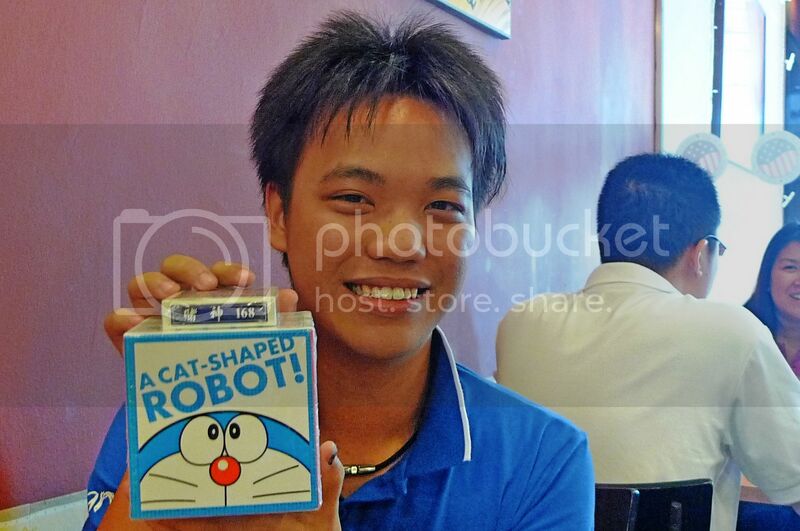 QuaChee's gift was a puzzle because it looked kinda funny. 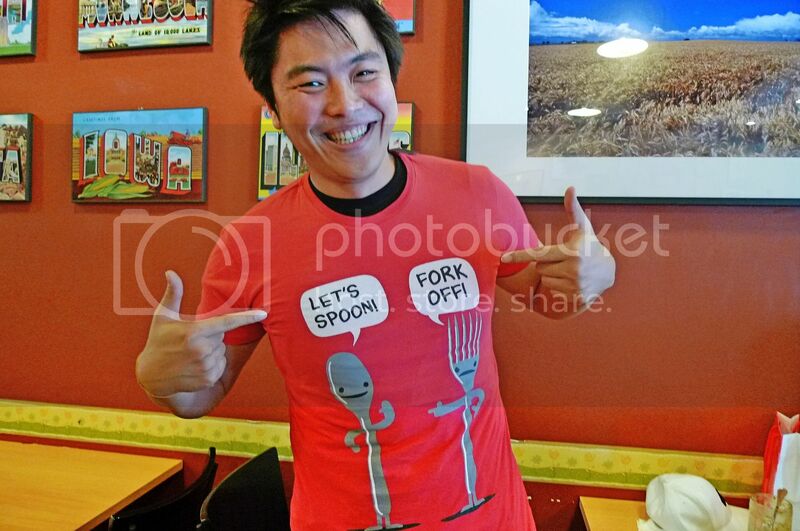 It turned out to be a T-shirt! But it was no ordinary T-shirt. Look at that! Haha! 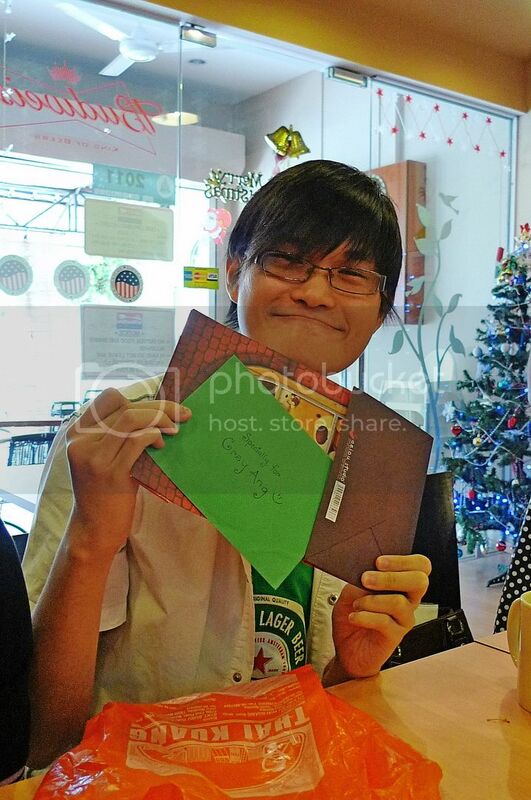 In turn, Eric received his gift from QuaChee, which was a notebook. What?! A laptop? 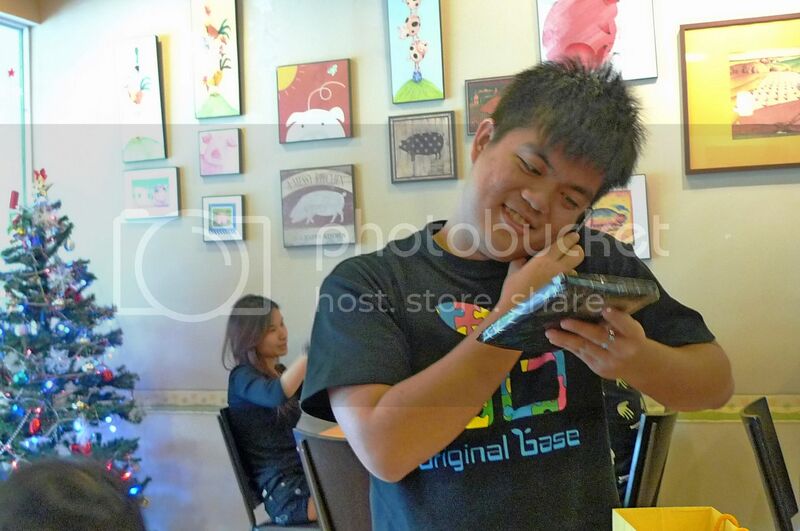 Look here at Eric happily talking on the phone with his darling Caroline while pretending to admire admiring QuaChee's laptop notebook. Although Caroline was not present at the gathering, she was part of the Secret Santa event and so she also received a gift, which I think was an umbrella from Saucer. Eric received the gift on her behalf. Now that I have mentioned everyone, who do you think was my Secret Santa? OK, I give you a minute to think. It was from no other than Eric! And I managed to guess it was him simply because he had earlier told us that he forgot to wrap his present and his was the only unwrapped present! Anyway, what did he get me? Oh! So naughty of QuaChee to place that drink there! 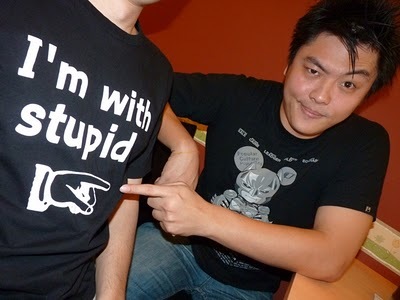 Luckily, I sat next to him and wearing this T-shirt I'm sure you can guess why! Haha! Thanks to Eric, now I can take photo with the rest of the gang. 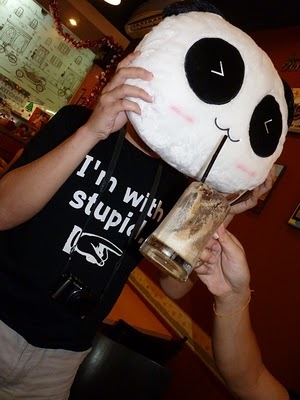 I just need to remember to bring my panda head every time I go out with them! Haha! Ok, here's one for the album! It was a fun and enjoyable day with my blogger and Twitter friends at Betty's Midwest Kitchen! Looking forward to my next Secret Santa event this December!